Laser Heat Vision!!!! | Random moosages as I see fit. We interrupt your regularly scheduled post for breaking news (you’ll see the post I originally scheduled next Friday). Ok, so it’s not really breaking. But as of this writing (Thursday night) I am but mere hours from finally accomplishing a dream of mine. That is to get LASER HEAT VISION! You may wonder what laser heat vision is. 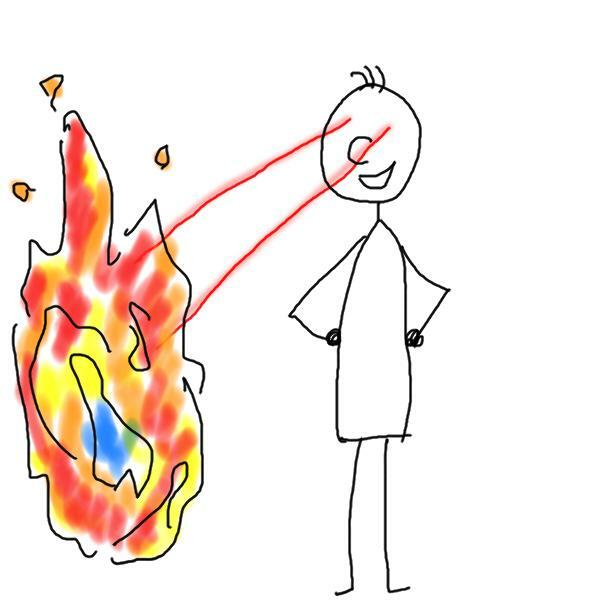 It’s something of a cross between Superman’s heat vision and something similar to Cyclops’ optic blast. Cyclops’ laser vision is more concussive and that’s not really what I’m going after. Not that it wouldn’t be fun. I’m not really going after the weird, non-laser powers of Darkseid‘s omega beam either. I’m mostly interested in the burny meltiness of lasers. More like Timmy‘s heat vision. Anyway, you may also wonder how I’m going to accomplish such a feat. Simplicity itself. I’m getting LASIK done tomorrow. Now, I realize that most people don’t get LASIK done and then come back with laser heat vision but I plan on doing something different. I plan on eating a lot of tomatoes before going in for the procedure. Why tomatoes? Why surely you remember the investigative blogging we did on laser tomatoes. Now, eating a bunch of raw tomatoes is dangerous stuff. I’ll have to make sure to take the proper precautions so I don’t accidentally blast someone’s head off or even my own head. If I didn’t have a head, I would have no use for laser heat vision. That would make me sad. Oh, also I’d probably be dead. That would probably make me sad too. So, I plan to eat a whole meal of tomatoes with utmost care and precision tomorrow before the operation. Thus, with my stomach still digesting tomatoes, I will undergo the procedure and the laser used to reshape my corneas will hopefully react with some of the tomato essence going through my bloodstream and I will obtain LASER HEAT VISION!! It probably won’t happen right away. They tell me that I’m supposed to sleep as long as I possibly can after the procedure. They say it’s so the corneal flap can seal and start the healing process right away without my blinking interfering with everything. That might be true, but I think maybe they’re hoping that I won’t find out about the laser heat vision. Maybe it won’t work after you finished digesting all the tomatoes. Maybe I’ll have to constantly refuel with tomatoes to be able to utilize my laser heat vision. I don’t think I would mind. I really like tomatoes anyway. But I intend on using my powers as soon as I can. I might take that 12 hour nap/zoymb/sleep like they’re asking me to. I suppose I should try and refrain from using my laser heat vision during that time. It probably would interfere with my corneas healing. But I’ll definitely try when I wake up. They tell me I have to sleep with these interesting eye shields on. It’s probably to try and minimize the damage when you wake up and accidentally shoot lasers out of your eyes. How was your tomato lunch? Full of vegetables now that Congress has decided that pizza sauce is considered a vegetable.